The club is actively run by members who have many years of experience with the breed and have a wealth of knowledge to offer. Club members and their Airedales meet once a week for over two hours, where they can brush up on their basic obedience. The time is valuably spent socialising the dogs, and we incorporate exercises where the dogs have to work in close proximity with each other. 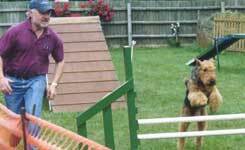 Members are encouraged to practice at home the exercises given by the trainer, and hopefully this will lead to more advance work when the dogs have reached the required level of control. Is as its name implies, a training club for Airedale Terriers and their owners. It is the only training club in the UK for the Airedale Terrier to be affiliated to the Kennel Club. The objectives of the club are to encourage and provide advice and training facilities to all Airedale Terriers and their owners, to preserve the conformation of the breed, to promote the working role of the Airedale Terrier in the United Kingdom and to re-establish the breed in official Kennel Club obedience, working trials and agility competition. It is a myth that the Airedale Terrier cannot be trained; with hard work and dedication everyone can have a well trained, obedient and loyal friend. On several occasions the Airedale Terrier has been selected to represent various regions at Crufts in the team obedience event.We are very proud to have the very well known and respected figure Mrs Mary Swash of Jokyl Airedale Terriers as our club president. The club is always on the lookout for new members, and even if you live too far away to come to our weekly training sessions there are many other advantages to becoming a member of the ATTCR. by filling in the membership form today.